Many of us suffer from dark under eye circles. It makes us look tired and worse. Makes us look older than our age. But with this one ingredient you can eliminate dark circles. You interested? 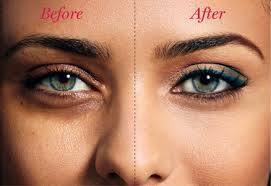 Lets see Effective Home Remedy for Dark Circles. The good news is this. It is cheap and affordable. All natural and simple to use. You need baking soda, cotton pads, hot water or tea. Use a container/glass or cup with hot water or tea. Mix one teaspoon of baking soda into the water. Soak the cotton pads in the water mixture. (Two cotton pads). Leave over eyes for 15 minutes. Afterwards wash your face with mild water and don't forget to moisturize. But with this home remedy don't forget to eat right, get enough rest and make sure to exercise. As all this can be factors for having dark circles. You will be amazed at how effective this works. Feel free to tell or share the post so others can be helped too. If you have any thoughts you want to share. Feel free to contact us or comment. We love to hear from readers.